Just who is Margaret Read and why does nobody seem to know her? 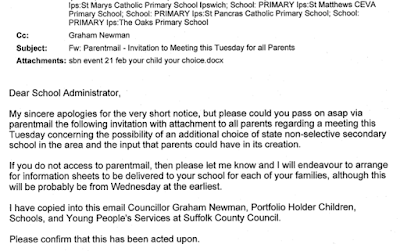 As I reported earlier someone calling themselves Margaret Read has been emailing information about the Stoke by Nayland free school proposal to local head teachers and discussing the school with Graham Newman, Cabinet Member for Education making disparaging remarks that "SbN Freeschool will also help to 'kick up the backside' coasting neighbouring schools with inexcusable poor performance"
I cannot control the e-mail communications I receive from people and unfortunately the sender of an e-mail, or the creator of a blog, can call themselves anything they wish. I have not met or spoken with the said "Margaret Read". I attended the meeting at Stoke by Nayland Golf Club on 21st February, and actually asked to be introduced to her, without success. 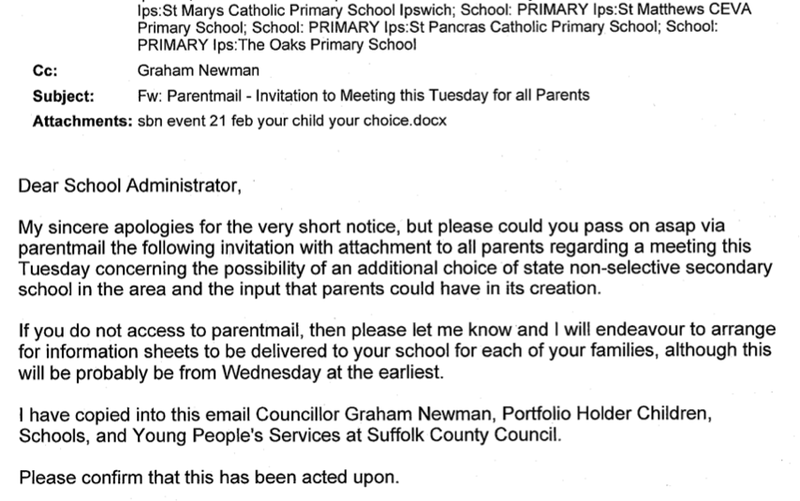 When I asked a member of the parent group at the subsequent Stoke by Nayland meeting to be introduced to her, I was told she was not known to the group. This doesn't mean she doesn't exist. I have never written to any school to endorse her communication. 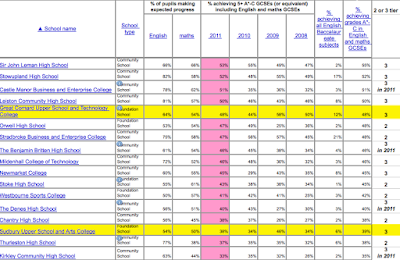 Might I draw your attention to the attached spreadsheet, which perhaps suggests from where people get their idea that something needs to change... Look at row 31 and row 41. So if something needs to change it is Newman's own view that the something is a move to two tier. Or maybe Newman doesn't believe his own policy any longer? After all most of the free school proposers are actively opposed to the move to two tier and are wanting to "save the middle schools" the very things Newman wants to see closed to improve standards! As I reported earlier as soon as I emailed her for a comment the email her Yahoo mail address suddenly vanished. All very mysterious. It seems to be something quite common in free school proposals for those proposing the schools to appear to want to conceal their identities. I have no idea why. I don't see how or why I, SCC or anybody else, should prevent members or supporters of any Free School group campaigning to attract parents to their proposals. It is equally impossible to prevent people hiding behind the anonymity afforded by the internet from making statements which appear to imply my support for their actions. 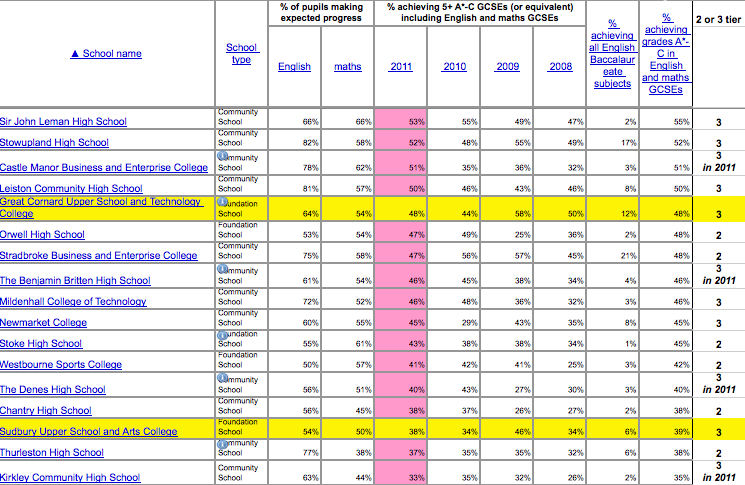 It should be borne in mind that, for all the free school proposals in Suffolk, there appear to be solid bodies of parental support (which obviously vary numerically) and they have a right to their opinions. So if anyone does know who Margaret Read is please can you contact me. I am beginning to wonder if she actually exists!